As a Construction Electrician you will be involved in many aspects of construction work. This chapter touches on a few of these, such as rigging and hoisting, equipment movement, hazardous material, embarkation, and tool kits. Although this chapter does not deal with electrical work, you need to study and refer back to this chapter for your safety and the safety of your shipmates. The safety of personnel involved in rigging and hoisting operations largely depends upon care and common sense. Equally important is the proper selection of lines and slings for safe and stable lifts. The single most important operational check to be made on hoisting and rigging equipment is the line and rigging inspection. Such factors as abrasion, wear, fatigue, corrosion, and kinking are of great significance in determining usable life. The only way to determine the safety of a line, its life expectancy, and its load-carrying ability is by regularly inspecting every foot of its length. The main points to watch for are external wear and cutting, internal wear between the strands, and deterioration of the fibers. Fiber lines are made from either natural or synthetic fibers. The natural fibers come from plants and include manila, sisal, and hemp. The synthetic fibers include nylon, polypropylene, and the polyesters. The strength of these lines depends on their size, the fiber used, and the type of stranding. Figure 1-1. 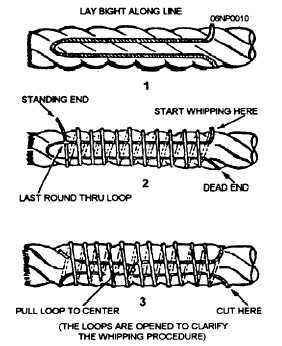 - Removing line from a shipping coil. New line is coiled, bound, and wrapped. The protective covering should not be removed until the line is to be used. This covering will protect the line during stowage and prevent tangling. To open, strip off the outer wrapping and look inside the coil for the end of the line. 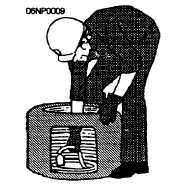 This should be at the bottom of the coil. If not, turn the coil over so that the end will be at the bottom, as shown in figure 1-1. Pull the end of the line up through the center of the coil. As the line comes up through the coil, it will unwind in a counterclockwise direction. whipping refers to the process of securing the ends of a line to prevent the strands from unraveling and the yarns from separating or fraying. Whippings are made from fine twine and will not increase the size of the line enough to prevent it from fitting the blocks or openings. Figure 1-2. - Proper way to apply a line whipping.